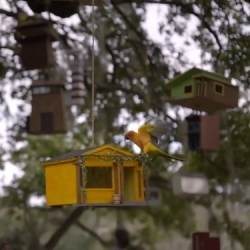 Airbnb's latest campaign Birdbinb compares birds to travellers, creating 50 birdhouse replicas of Airbnb listings. The resulting birdhouses were strung up at the “Tree of Life” in New Orleans’ Audubon Park. Find out more about the campaign at http://birdbnb.com/.